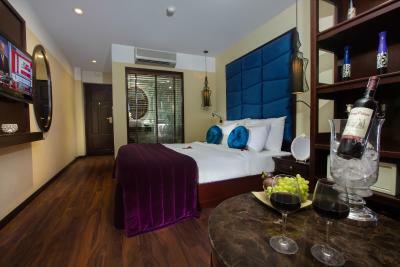 Lock in a great price for Hanoi Trendy Hotel & Spa – rated 9.5 by recent guests! 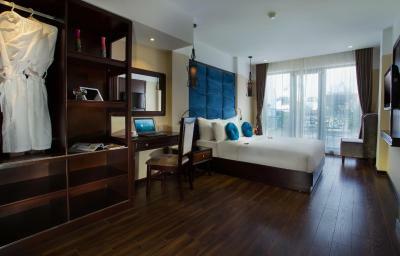 In my opinion one of the BEST hotel you can find in Vietnam! Helpful and kind staff, superb room. Amazing! Excellent location, quite central and near the main places to visit. Very good breakfast, with special/individual extras upon request (included). Amazing Pho on breakfast. Very friendly staff, always ready to help. Staff was really friendly, sweet, and helpful. It was one of the best hotel having awesome staff I’ve ever stayed. We had some troubles but staff solved our problems. Hanoi. My first stay in Vietnam. Arrived jet-lagged and fearful of culture shock. No need to worry. Friendly welcome by lovely staff at Trendy Hotel and free coconut drink. Panic over. 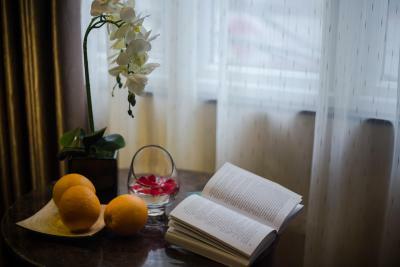 Lovely cosy room and bed followed by exotic fruit, coffee and the best omelette in town for breakfast. No panic now. 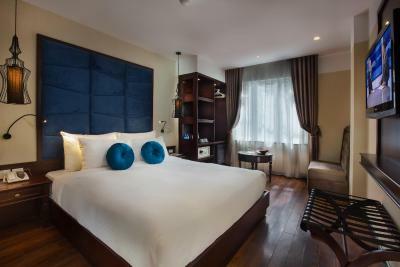 Free to explore exotic Hanoi (with a lot of help from the Trendy travel desk) and two more nights to look forward to in this home away from home. The staff are very helpful and go out of their way to meet whatever demand, need one might have. The rooms are modern and a good walk from just about everything. The rooms are also cleaned daily, but they ask if it is okej to do so. WiFi isn’t working so well, but that’s in most areas in Vietnam, better to get a 4g, which the staff will help you with. Very welcoming environment all in all can definitely recommend. The staff was amazing, they were friendly and really trying to please you! Very helpful staff, always someone around who understood our needs and was easy and relaxed to communicate with. Nice clean and silent rooms. The only place I’ll ever book in Hanoi. 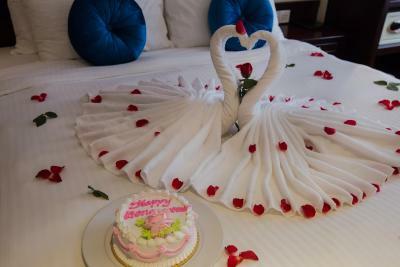 Staff, amenities, cleanliness, facilities and service were all top notch. Breakfast was amazing and had lots of options. Loved the location! Staff was very friendly and helpful! 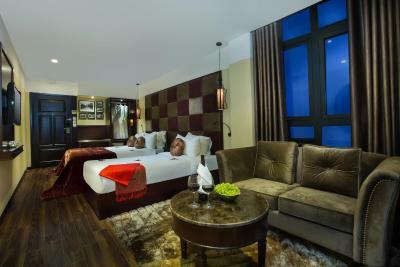 Hanoi Trendy Hotel & Spa This rating is a reflection of how the property compares to the industry standard when it comes to price, facilities and services available. It's based on a self-evaluation by the property. Use this rating to help choose your stay! 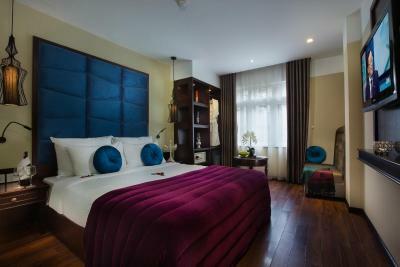 Value-for-money soundproof rooms with free Wi-Fi are provided at Hanoi Trendy Hotel & Spa, a boutique hotel in Hanoi's Old Quarter. 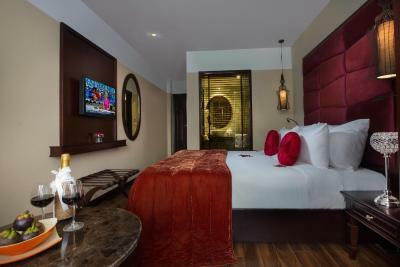 Charming and chic, air-conditioned European-style rooms come with a flat-screen TV, a fully stocked mini-bar and nightly turn down services. Daily newspapers are available. Guests can check e-mails or surf the internet at the computer corner. Travel and entertainment plans can be arranged with the 24-hour concierge services. 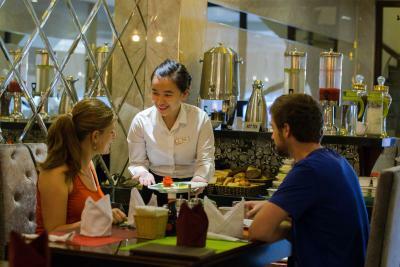 Breakfast is served from 6:30 to 10:00 daily. 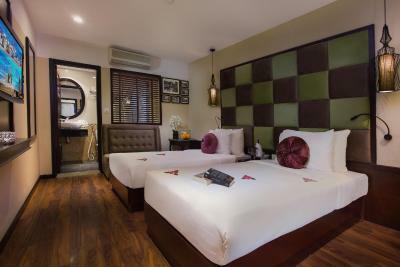 Hanoi Trendy Hotel & Spa is a 10-minute walk to the famous Sword Lake (Hoan Kiem Lake) and within easy reaching distance to commercial and shopping streets. 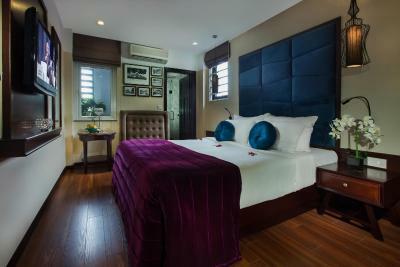 When would you like to stay at Hanoi Trendy Hotel & Spa? 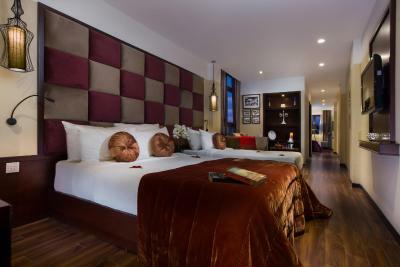 This well-appointed room has an private bathroom with 24-hour hot shower facilities. It is equipped with cable TV. 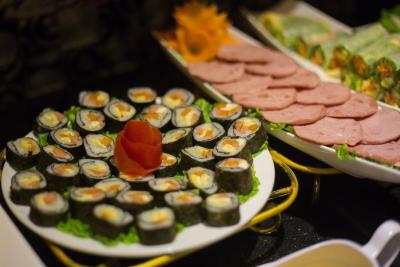 Private parking is available at a location nearby (reservation is not needed) and costs VND 69913.97 per day. 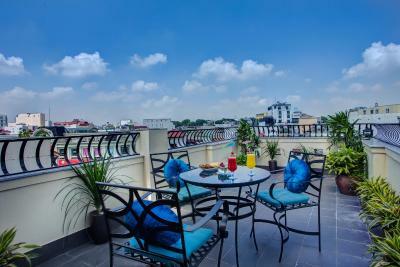 Overlooking Hanoi Old Quarter, large rooms are located on floors 2-4. Bathroom has a standing shower, hairdryer and free toiletries. Suite features a window with panoramic views of the streets. Spacious suite features panoramic views of Hanoi's Old Quarter. 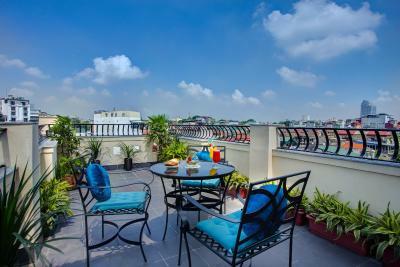 Spacious suite features a large private balcony with panoramic views of Hanoi's Old Quarter. 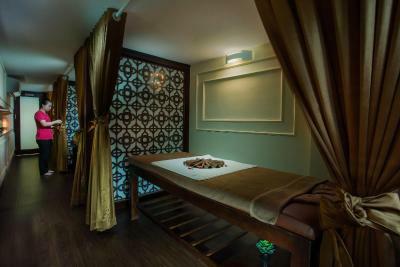 This larger air-conditioned room is located on the higher floor. The seating area is fitted with a flat-screen cable TV and a sofa. The private bathroom includes a hairdryer and free toiletries. 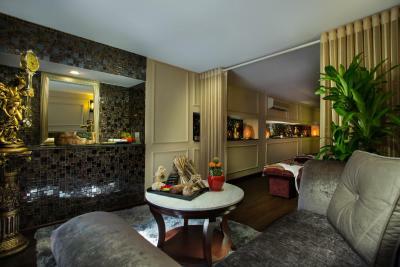 Located on the lower floor, air-conditioned room comes with a seating area, flat-screen cable TV and sofa. The private bathroom includes a hairdryer and free toiletries. Please note this room has an internal window but has no view. 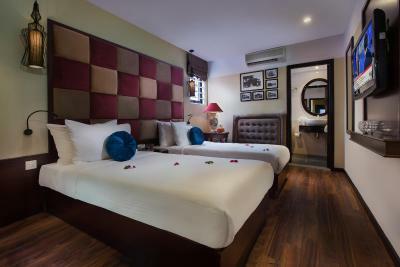 Hanoi Trendy Hotel & Spa is a successive pride of Hanoi Marvellous Hotel Group in order to bring a homely & comfortable stay to every of you. 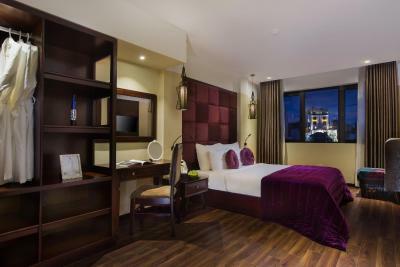 Besides of Deluxe rooms for single, couple or twins shared, we are proud to provide an array of Grand Suites for family or group from 3 to 6 people in each. 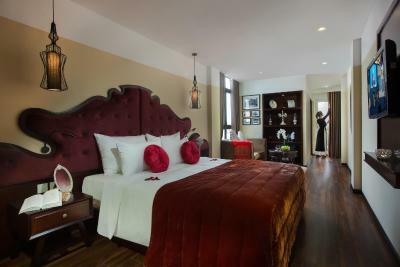 Being the very first and unique hotel offering this large of choices, we ensure your satisfaction and privacy in the right center of Hanoi Old Quarter. 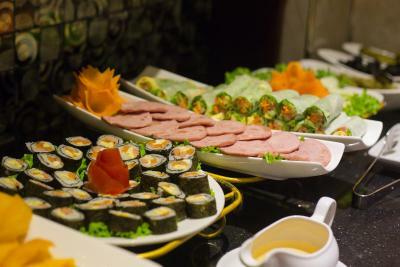 Combination of luxury modern design and coziness, warm welcome and 24 hour service, knowledge and friendly informative care, you can easily find right place for demands of both leisure or business target. 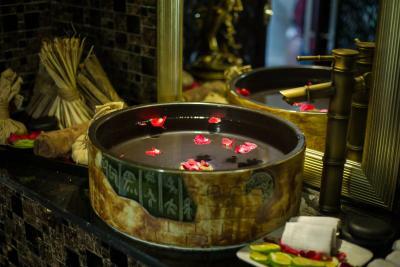 House Rules Hanoi Trendy Hotel & Spa takes special requests – add in the next step! 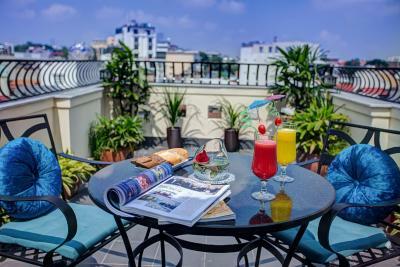 Hanoi Trendy Hotel &amp; Spa accepts these cards and reserves the right to temporarily hold an amount prior to arrival. Hanoi Trendy Hotel & Spa accepts these cards and reserves the right to temporarily hold an amount prior to arrival. We booked the 'Grand Suite with Balcony', a fantastic room to spread out in as a family when spending a few days in Hanoi. We just loved watching the crazy street goings on below from the private roof terrace. The room was very spacious with 2 massive beds, a single and a sofa - Perfect for families or 2 couples, as the bathroom divides the two areas for privacy - The room is even bigger than it looks on the photo's. The bathroom had a great shower and was spacious. The location was great, a short walk to most things and breakfast was good. Nga and Jolie on reception were so friendly and helpful! Their English was amazing! Thank you ladies! We would definitely stay here again! We had lovely stay. Central location but quiet and nice rooms. Good breakfast. Great staff and customer service. Very helpful with everything. 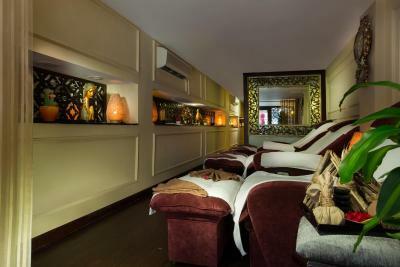 Spa downstairs is also worth trying. Had excellent hot stones massage. Highly recommend! Everything was really good. 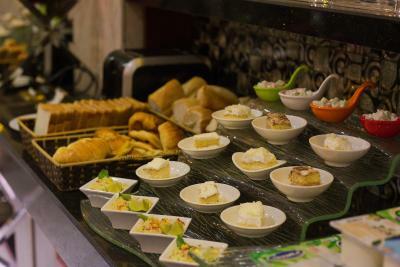 The breakfast is really generous and tasty, the personal is so kind. 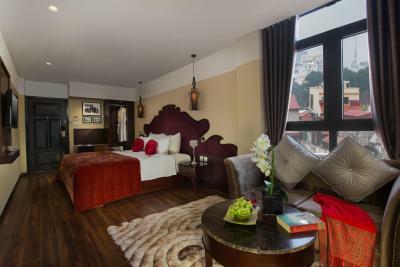 The location is perfect if you want to stay in the old city. 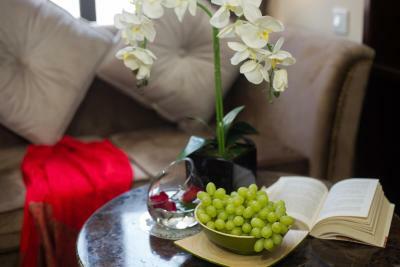 Fantastic hotel, optimal location, super attentive, competent and friendly staff. 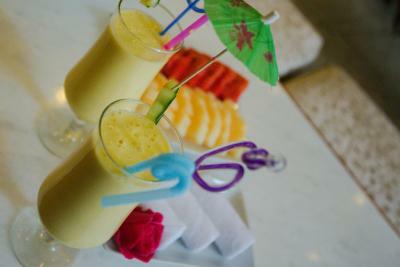 Beautiful chic decor, delicious nutritious breakfast, and friendly helpful staff. Bun Bo - a restaurant a few doors down, was the best food we’ve had in Vietnam. Stayed here on two occasions on a recent trip. The staff were amazing, very helpful and friendly. Great location. Nice rooms. Nice breakfast. Can’t fault this hotel. The flexibility of the hotel. We arrived earlier and they made us feel confortable at their lobby and offered water and shower! We would go back! It might be a bit noice in the morining due to the proximity to the street. The staff was great and the location was very good. Everything is in walking distance. Our visit started with an arranged transfer through the hotel which I would highly recommend. The taxi was high quality and helped arriving at the hotel relaxed. When we arrived we had a welcome drink and dried fruit which was lovely. Our bedroom was gorgeous, had all amenities that we needed and comfortable bed. The breakfast had good choice. 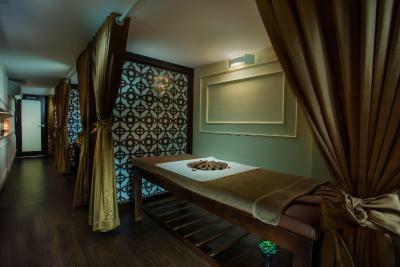 We also used the spa several times due to it being good value. The staff could not do enough for you and were very friendly. The location was great and despite hanoi being busy and noisy you never heard the noise. I could not fault anything here. There is also a fantastic coffee and patisserie next door which we visited each night. Everything was very good and nothing to ask more. Breakfast is very good, essentials are in it and it tastes good. 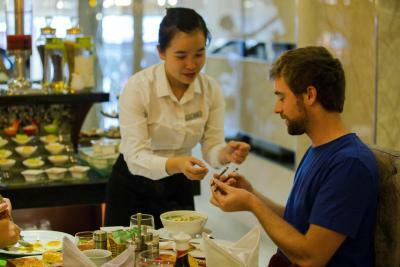 Service is very good and staff is attentioned and supportive. Breakfast just could have some more choices but it is already good.